Spravato, a mind-altering medication related to the club drug Special K, won U.S. approval Tuesday, March 5, 2019, for patients with hard-to-treat depression, the first in a series of long-overlooked substances being reconsidered for severe forms of mental illness. On Tuesday, the U.S. Food and Drug Administration approved a new drug to treat depression in those who haven’t responded to previous medications -- the first novel treatment in decades. 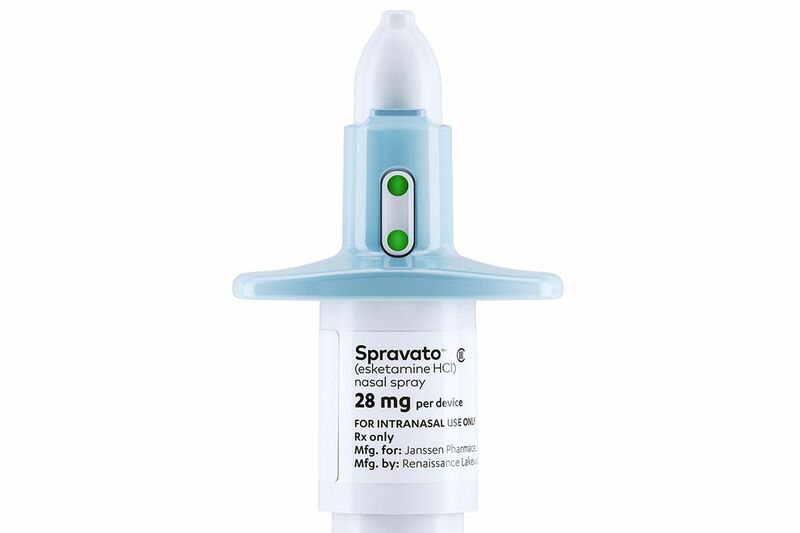 Esketamine, also known by the brand name Spravato, is a nasal spray developed by Janssen Pharmaceuticals. Experts say it offers a new option for about five million Americans who have major depressive disorder that hasn’t been helped by current treatments. But there are also serious side effects to consider and many unknowns about the drug’s long-term effects. 1. What is treatment-resistant depression? According to the FDA, individuals are considered to have treatment-resistant depression when they don’t respond to at least two different antidepressants. Responding to a medication generally means seeing at least a 50 percent decrease in symptoms, Thase said. In practice, many people don’t come to think of themselves as having treatment-resistant depression until they’ve tried four or five therapies, he added. In the U.S., treatment-resistant depression affects about one in three people with depression. 2. What is in this new drug? Esketamine is derived from ketamine, an anesthetic that’s been widely used since the 1970s. Ketamine was once also a popular party drug called Special K, primarily used in the 1980s and 1990s. The new treatment has some intoxicating qualities, which may lead patients to feel drunk or impair judgment, so it must be delivered in a doctor’s office by a medical professional. 3. How is it different from other antidepressants? Most antidepressants target brain chemicals known as serotonin, norepinephrine, and dopamine. They work through indirect mechanisms that can take weeks or months to show effect, Thase said. Esketamine instead targets a brain chemical called glutamate -- a fast-response system, Thase said. Patients can feel improvement within days or even hours. 4. How effective is it? Esketamine was tested in four clinical trials as part of the FDA approval process. All trials were paid for and carried out by Janssen. All patients were started on a traditional antidepressant, and a select group were given esketamine as well. The goal was to see if esketamine does more than the other drug, Thase said. In one trial, the nasal spray was significantly more effective, and patients started feeling effects within two days. Another trial focused on people whose depressive symptoms had stabilized, and found that those who continued with esketamine treatment were less likely to relapse. The two other trials did not show significant effectiveness. One showed improvements but not at the highest level, Thase said. The other focused on an older population and showed little improvement. “At the end of the day, we don’t know if this works for people over the age of 65,” Thase said. 5. What does the treatment look and feel like? FDA approval requires the treatment only be administered in a doctor’s office or clinic, and patients be monitored for at least two hours after receiving it. Patients should not drive on the day of treatment. These measures are meant to ensure patients stay safe while experiencing potential anesthetic or hallucinogenic effects, Thase said. Only a quarter of patients typically experience those effects, and they subside after 90 minutes, he added. The recommended course of the drug is twice a week for four to six weeks, followed by a gradually decreasing frequency. 6. Are there other side effects? In clinical trials, the most commonly reported side effects included disassociation (feeling disconnected from time and surroundings), dizziness, nausea, anxiety, increased blood pressure, and vomiting. The FDA warning label on the drug cautions users they could experience sedation, problems with attention or judgment, or suicidal thoughts. There is also a potential for abuse with the drug, Thase said. That’s part of the reason it’s not being sold in pharmacies. Doctors will have to weigh whether or not to prescribe it to patients with a history of substance use disorder, he said. Long-term effects of the drug are largely unknown, as clinical trial patients are just moving into their second year of treatment now. The list price of the drug will be $590 to $885 per treatment session, based on the dosage taken. But it’s unclear how much Medicare, Medicaid, or commercial insurers will pay for it, Thase said. FDA approval makes a drug more likely to be covered by insurers. “It’s also unknown what the administration cost will be that goes along with clinicians giving the treatment,” Thase said. The cost will likely play a big role in determining how widely the treatment is used, he said. Some doctors may choose to prescribe it after two traditional antidepressants don’t work. Others may choose to try more alternatives first.